Fruit cages are an expensive addition to any garden, even a basic walk-in type will cost you well over a hundred pounds by the time you have included the frame, the netting, the door, the clips and other accessories. This article aims to identify the main retailers of fruit cages in the UK and explore the different types of fruit cages on offer including an idea of the prices. We also explore some of the options available if you want to go down the DIY route which is of course a lot cheaper. We list below all the online retailers we could find who specialise in fruit cages. If you know of one we have missed then contact us so that we can include them here. The suppliers below are listed in alphabetic order. Prices are without any discounts. The basic price comparison mentioned for each of the companies below is based on a galvanised steel frame (W2.5m L5m H2m) with one door and netting. Heights vary, read the descriptions below. Some suppliers do not have steel frames so please read the descriptions below carefully to allow accurate comparison. Where possible we also mention prices for aluminium frames which are cheaper to produce. 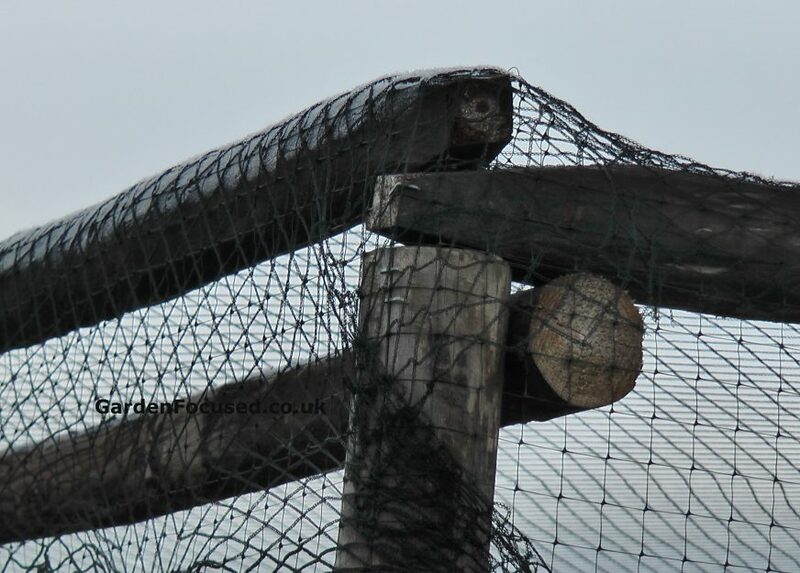 The netting supplied with each of the fruit cages below is designed to prevent birds from gaining entry to the cage, note that none claim to prevent squirrels entering. If you require protection from butterflies (and thus most types of caterpillars) then a much finer netting will need to be purchased. We would suggest that 7mm netting is likely to protect against most butterflies. The prices and descriptions below were last updated in December 2018. In truth, the range of Agriframes fruit cages is so extensive, probably the most extensive of all, that it's difficult to nail them down to a specific product. They have low height, full height, narrow, Roman and Gothic styles etc. and more. For our average price check we have chosen their standard steel fruit cage range at W2.5m L5m H2m priced £338. Their website (as far as we can see) gives no indication of the diameter of the uprights or top rods. Slightly surprising given they are at the very top end of the price range for fruit cages. So it's not possible to guess how structurally sound they are. However they do have one outstanding feature - they guarantee their products for 10 years, well above the industry standard. The mesh they use to cover their frames (no other option appears to be available) is 20mm x 15mm on the sides with 20mm x 20mm on the roof. First Tunnels do not have an extensive range of fruit cages, they have kept your options to the bare minimum. However, these are strong cages made only from steel with no aluminium option available. Both uprights and top rods are made from 25.4mm diameter steel. Height is the largest in this comparison at 2.14m / 7ft. There doesn't appear to be any option to extend or change the size. There is only one option for the mesh used, it's 17mm x 17mm on the sides and 18mm x 18mm for the roof. They claim this provides bird and butterfly protection however almost all butterfly netting is 7mm or smaller. In our view, a mesh of 17mm will not protect against some butterflies only birds. Average price check (W3.8m L3.8m H2.14m) is £220 for a galvanised steel fruit cage with one door and netting. Postage is free to most of the UK. A solid, strong fruit cage at a reasonable price. We couldn't find any mention of a guarantee on their website so you will need to check this out before purchase. Garden Skill have three ranges of fruit cages which suit a wide variety of budgets and situations. Their Pop Up range has prices from £8 to £54 and they come in a range of different netting options. Clearly at those prices they are not going to stand up to harsh weather conditions but in protected spaces they will do the job well. Some are even high enough to stand up in! The Pop Up range is exactly as their name suggests, unpack them from their carry bag and they pop up immediately. No construction required at all. They are manufactured from spring steel. The Build a Cage range is made from aluminium (steel not available) with 16mm uprights and 12.65mm top rods. The push fit joints are reinforced with steel. There are three heights, 0.625m, 1.25m and 1.875m all in a range of sizes and with different netting options. Prices range from £30 to £125. Extension kits are available. Their larger and more substantial Walk In fruit cages have 25mm aluminium (steel not available) box section uprights and top rods and a height of 2m. They can be extended ad infinitum in 2m sections. Netting is 20mm. Average price check is £275 for an aluminium frame, netting and sized at 4m x 2m with one door. Delivery is an additional £12.45 to most of the UK. All fruit cages come with a 12 month guarantee. This looks to a be a solid product well worth considering. This company does not supply walk-in fruit cages, their highest fruit cage is 1.5m. However, they are included here for those who do not require full walk-in fruit cages. Supplied in steel or bamboo. Prices rabge from £34 to £57. Average price check (W2.5m L5m H2m) £213 postage free for most areas. These fruit cages are a mixture of steel for strength and some aluminium for lightness, a door and quality netting is included. The crossbars and door are 19mm aluminium with the made from 19mmsteel. The netting mesh size is 19mm. Their fruit cages and netting are manufactured in the UK and the company was first established in 1895! Good product at keen prices although we could find no mention of a guarantee for their fruit cages. Average price check (W2.5m L5m H2m) £310 for a galvanised steel, powder coated fruit cage with one door and netting. The frames (both aluminium and steel) are strong, being 25.4mm diameter uprights and 22.2mm diameter top rods. The cages are 2m high. For comparison purposes the same sized aluminium fruit cage costs £219. Both of the aluminium and steel frames mentioned above have a delivery charge of £15.00 to most of the UK. Frames are guaranteed for 10 years. Knowle Nets supply a full range of aluminium and steel fruit cages in a large variety of dimensions, including their low height (1.3m) range. They have a choice of netting options. These look to be good quality fruit cages from a company which was established in 1965. In the fruit cage and polytunnel business for over 40 years with all the parts manufactured in the UK by themselves, this is a company with a reassuring history. They have their own state-of-the-art computerised systems for analysing the effectiveness of their designs. So, if you want the best designed fruit cage and you would like it to be British then Northern Polytunnels should definitely be on your shopping list. An analysis of what they offer for the price leads us to believe this is one of the top companies for fruit cages. The average price check is £221 with free delivery to most areas and the tubular steel components come with a lifetime guarantee. A door is included and netting is 19mm. Uprights and cross bars are all made from steel with Northern Polytunnels Armorguard coating which has a life time guarantee. The diameter is 25mm with a wall thickness of 1.5mm making them one of the strongest and most durable of the fruit cages in this comparison. They have our top recommendation. We tried out their online chat helpline and were impressed with the responses we received and the speed. If you want to gain an insight into how you can build a fruit cage, the video on the Northern Polytunnels website (see towards the end of their page here) is excellent showing one of their fruit cages being constructed. 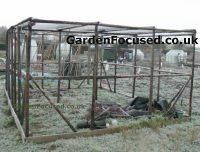 Note at the beginning of the video how easy it is to change the height, width or length of this fruit cage to suit exactly the space you have available in your garden or allotment. Average price check (W2m L4.8m H2m) £268, delivery free (to most areas) for a galvanised steel fruit cage with one door and knitted netting. Note that this size is smaller compared to our average price check specification. This is a family run business which has been in business for over 25 years, they major on personal service and uniquely, offer an out of hours construction helpline up to 9.00pm in the evening. For any not so handymen like me that's superb service! Average price check (W2.5m L5m H2m) £246, delivery free (to most areas) for a galvanised steel fruit cage with one door and netting. These look to be good value fruit cages and good quality, definitely worthy of consideration. Their fruit cages are manufactured in the UK so if you want "home grown" fruit cages then this is a good choice of company. They also produce aluminium fruit cages. A good selection of sizes. Uprights and top rails are 20mm in diameter (thickness not given), the netting is 18mm square mesh on the sides and 20mm over the top. Average price check (W2.5m L5m H2m) £298 with free delivery to most areas supplied with netting and one door. Slightly cheaper aluminium fruit cages are also available. Appears to be very easy to assemble and good quality. We searched their website and found no evidence of a long term guarantee for their fruit cages. Definitely one to consider and the company has existed from 1954 onwards. Probably the most important element to consider when selecting a fruit cage is the weather. If you live in an area that is likely to have snow at any time of the year then remember that most netting (pigeon netting possibly excluded) will collect snow and snow is surprisingly heavy. No manufacturer we know suggests that their fames / netting can support snow. The effect of this is the netting will need to be removed at the end of each growing season to prevent damage from snow. You could wait each year and only remove the netting if snow threatens but let's face it, removing netting from a fruit cage in sub-zero temperatures is not most people's idea of fun! In reality the netting should be removed and stored away each year by November at the latest. We checked out the impact of snow on fruit cages with four of the main suppliers and all of them stated that the netting should be removed if there is any danger of snow. Their opinions were all the same, even the much larger mesh of pigeon netting was not sufficiently large enough to prevent all damage from the weight of snow. We live in the Midlands and our weather is about average for the UK. It is not unheard of for a snow fall to occur up to late spring so fruit cage owners need to bear this in mind at the beginning of the season as well as at the end of the season. Wind strength is another factor that needs to be considered. If strong winds are common in you area then a strong and well-constructed fruit cage is a must. See the various construction materials discussed below for assessing the strength of a fruit cage. Height of the fruit cage is also very important. You need to consider the above ground height and work out if that is suitable for you. The length of frame supports which are below ground is also important. A length of 30cm / 12in below ground for walk-in fruit cages should be sufficient for most situations. Most fruit cages are supplied with netting as part of the package. However there are different types of netting depending on the protection you require from your fruit cage. If your intention is to stop birds then a wide mesh net is all that is required. Protection from butterflies and smaller insects will however require a much smaller mesh net. The point we make is for you to think about the protection you require and then consider if the fruit cage netting will provide that protection. A fruit cage is a costly investment so you need to make sure that it is secured to the ground well. Some fruit cages have very flimsy spiked feet which are not really suitable. Check out that your fruit cage can be secured easily and it will withstand a strong wind. In very stony or hard soil this might prove difficult, the use of a hole former might well be necessary. If so, you might want to include this in the overall price of the fruit cage. When it comes to walk-in fruit cage construction there are three main type, aluminium, steel and others which are mainly wood or cane based. A cheaper construction material compared to steel however it has lots of other advantages as well. First is that it is lightweight and easy to move and construct. Rust is not a problem for aluminium fruit cages, they simply don't rust and that has to be a bonus in the British weather! The only downside of aluminium fruit cages is their strength, they are weaker than steel framed fruit cages. This is not a problem in most areas but if strong winds are common in your area and the fruit cage is in an exposed position then you need to take this into account. These are generally more expensive than aluminium frames and come in a variety of finishes which will also affect prices. Steel readily rusts unless it is finished in a proper coating. Steel frames are also much heavier compared to aluminium ones which makes construction slightly more difficult. However steel framed fruit cages are far stronger compared to all other types of fruit cage. This can be very important if you are in an area which is prone to strong winds. These are by far the most expensive fruit cages and certainly not as strong as steel fruit cages. The other downside of timber fruit cages is that they require attention to maintain them in good condition. The benefit of a timber fruit cage is that it looks good, very similar to the difference between an aluminium greenhouse and a timber framed one. If you want the good looks that come with wood then your choice of supplier is limited. Pop-up fruit cages are a relatively new idea for protecting your fruit and vegetables in the UK. They are delivered in a light weight flat pack and take only a few minutes to unpack and assemble. Their shorter life span compared to traditional fruit cages is balanced by a lower initial cost, convenience and the ability to move them around to cover different crops at different times of the year. Protect early fruit such as currants and gooseberries and later on move them to protect cabbages, cauliflowers and other vegetables affected by insects. You do need to remember however that most (but not all) of these pop-up fruit cages are not high enough or large enough for working in. They will also need to be removed and stored during the winter months so make sure you have space for them. Garden Skill are the most well known name for pop-ups and they have a range of sizes but none of them are designed as walk-in cages. With only a little do-it-yourself capability it is quite possible to build your own fruit cage at minimal cost. 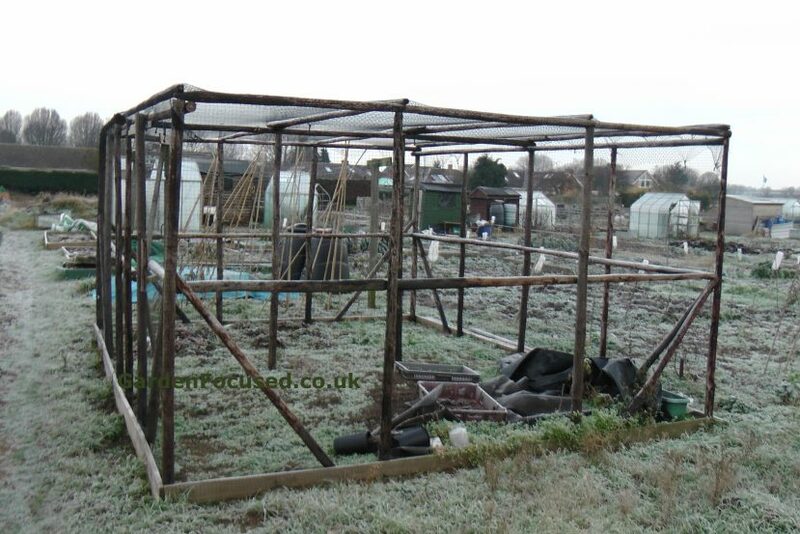 The fruit cage on the right (click the picture to enlarge it) was built for less than £100 and has lasted several years with very few signs of ageing. Reclaimed timber has been used to build the main framework which is constructed by shaping the timber where it joins and then simply nailing it together (see the picture below). Having built the frame work, cheap or reclaimed board is used to provide an edge at the base of the frame. Used skirting boards are a cheap way to do this.